I've been a part of the jeep club for a few months now (RIP Trailblazer) and I still love it! I've always dreamt of a white jeep wrangler and when I got one I was beside myself. I decided it was time for a tire cover and I'm personally not a huge fan of the covers with smiley faces, camo print or any sports logo (although if I had to chose a huge A for Alabama football would be my choice) so I knew making one was the way to go. I originally planned to sew a cover but after looking at the prices of fabric I decided purchasing one from eBay and painting it was the way to go. I found this black cover for $10 and free shipping (!!!). I painted some flowers and sealed it with a weather proof spray. I feel like I will be changing it up quite a bit, I had so many ideas going into it so who knows what the next tire cover will look like! Oh my goodness this is tooooo cute! 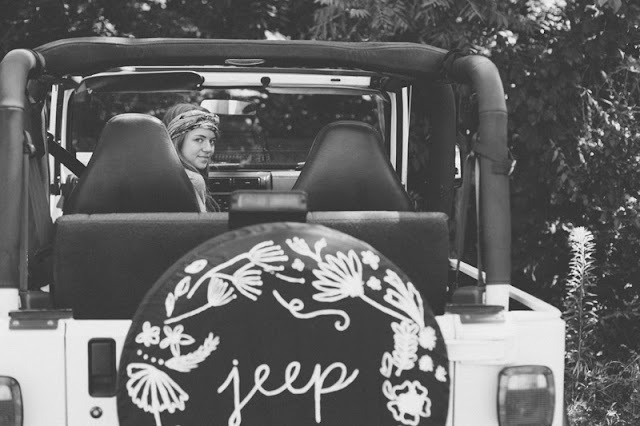 I am obsessed with jeeps, when I finally get my license (and I'm 19... soooooo I should get on that) I definitely want a jeep. 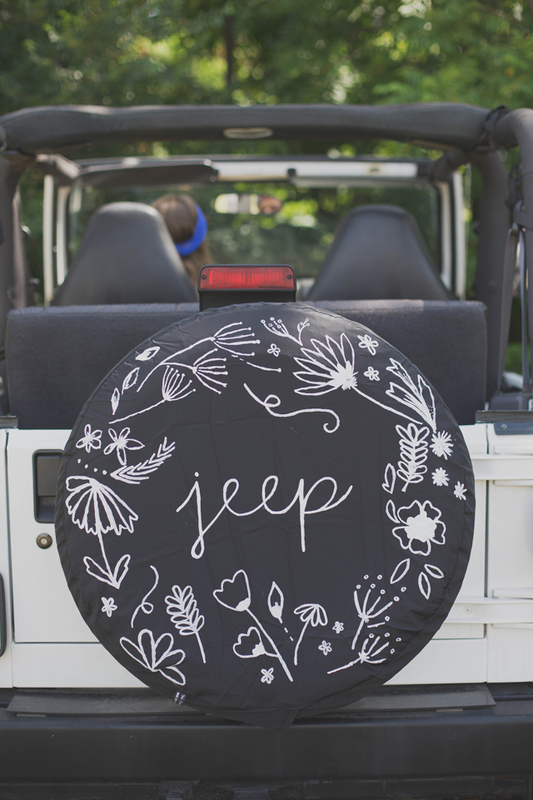 And when I get that jeep I'm going to do this. Your cover is BEYOND perfect. And so.. you! It looks like your blogs logo. Love it! LOVE this! 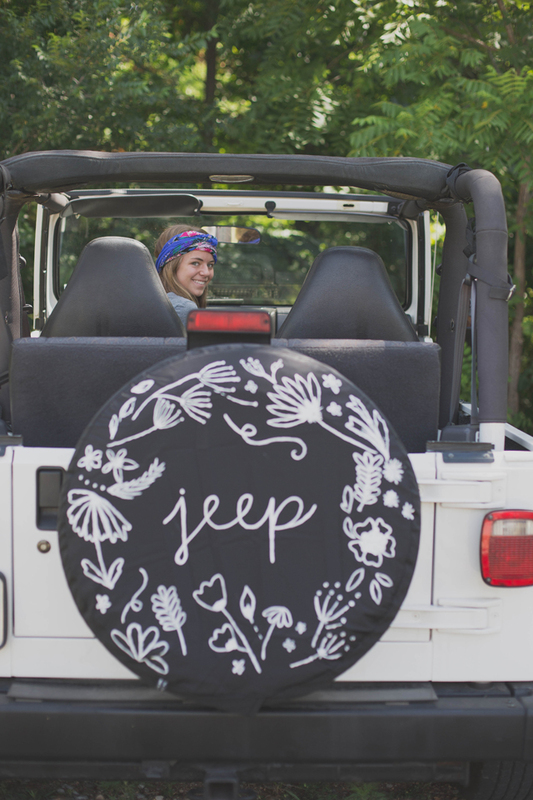 I have also always dreamt of owning a white jeep wrangler, congratulations on yours! if i wasnt married i would need to be a part of your house this upcoming year. the coolest ladies will live there. AHHHHHH! I LOVE THIS! WAY TO MUCH! I NEED A JEEP NOW! aw this is SO cute, what a great idea you're a genius! Ok... I NEVER would have thought of this!!! You are so talented!!! 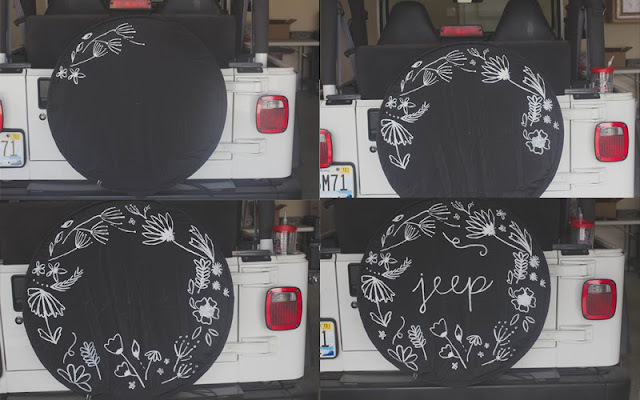 How did you ever think to totally transform a tire cover into a free people work of art???!!! oh my goodness! 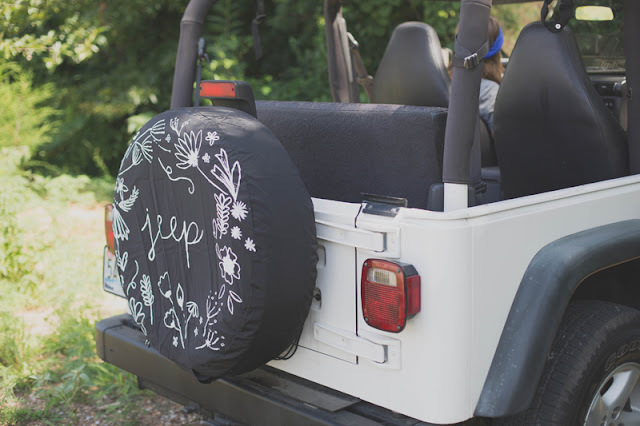 I love this girly touch to a jeep!!! Hi, nice post. Well what can I say is that these are an interesting and very informative topic. Thanks for sharing your ideas, its not just entertaining but also gives your reader knowledge. Good blogs style too, Cheers! Hi! I accidentally lost your email from a while ago when I asked. I was wondering if you could make me one of these? Maybe saying "enjoy the ride" on it though? But still with the flowers on the outside? My email is gracelarkin96@gmail.com! thanks! Hi I absolutely love this!! I was wondering if you have ever considered making these to sell! If so, can I have your email address and we can work something out?! So Can I pay you to make me one? What material is the cover made of that your bought from eBay? Love, Love, Love!!! I have a white wrangler too! If you don't mind me asking....What kind of paint did you use? I would love to make one of these. Hello! How do I buy one! ?